Search Las Campanas real estate listings below! Learn about the history and amenities of this community that make it so appealing. Established in 1992, the amenity-rich community of Las Campanas offers homebuyers the most dynamic range of custom and semi-custom luxury homes in the Santa Fe real estate market. Spanning across a seemingly vast 4,700 acres, surrounded by 68,000 acres pristine New Mexican high-desert, Las Campanas remains Santa Fe's only luxury master-planned community — offering buyers private homesites that blend perfectly with their surroundings, while having the convenience of being only minutes away from shopping, dining and exploring in historic downtown Santa Fe, as well as many other corridors into the scenic Northern New Mexico landscape. Are you ready to start your Las Campanas homes for sale search? Start by browsing the listings below or keep reading to learn more about this community. Don't wait any longer to register with Santa Fe Properties! You'll have access to advanced search options such as bookmarking your favorite listings. 109 Properties Found. Page 1 of 10. Santa Fe Properties' has been buying and selling Las Campanas homes for sale since the beginning, and as Santa Fe's leading independent real estate brokerage, a large number of our brokers that work in Las Campanas live there too. Neighborhoods in Las Campanas sport stunning golf course views, as well as 360 degree vistas of the Sangre de Cristo and Jemez Mountain ranges. This peaceful setting is home to more than a dozen distinctive neighborhoods, consisting of custom and semi-custom pueblo-style homes and residences with lock-and-leave convenience, to handsomely crafted log-cabin homes and pristine developer homesites that invite residents to match their living spaces to their lifestyles. Each home and homesite uniquely reflects the spirit of the Las Campanas community, offering warm, inviting gathering places for the indoor and outdoor living possible in New Mexico's mild four-season climate. 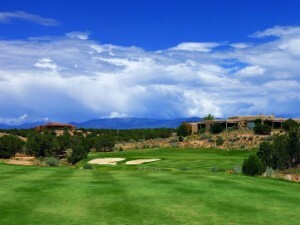 Las Campanas is home to The Club at Las Campanas, where residents enjoy a wide range of amenities. With its two signature Jack Nicklaus golf courses (Sunrise and Sunset), golfing at Las Campanas has garnered numerous accolades, including the 2015-2016 Golf Digest Best in State Rankings for New Mexico (Sunset Course ranked as #1 and the Sunrise Course ranked as #3). Awarded the Audubon Certification in 2016, The Club at Las Campanas also features an amazing Equestrian Center that sets high standards for caretaking of resident horses to optimize the pure joy of riding. The center also offers lessons, unique trail riding experiences and year-round riding events built around fun. Dining at The Club is truly a foodies paradise. Members feast on contemporary, regional and international dishes in the Hacienda Dining Room and its attached lounge — both the perfect setting to enjoy it all. Members can also nosh on light fare at The Torreon Portal, a sheltered exterior patio just off the 9th hole of the Sunrise Course. Additionally, The Spa Café at The Club at Las Campanas offers outdoor dining at the fitness, tennis and spa facility and features tasty breakfast and lunch classics, refreshing smoothies and cocktails. And when it's time to pamper oneself, the club's spa offers a full range of services including massage, facials, acupuncture, and nail and hair services. Discover the deep, authentic sense of community at Las Campanas and the kindred spirits there that make it truly special. Contact Santa Fe Properties for more information about Las Campanas real estate. If a particular home has caught your eye, let us know and we'll schedule a viewing!